The Bowl Fight was undoubtedly one of the wildest, most fascinating and most controversial customs of the University of Pennsylvania. Though never a dignified or a useful pursuit, it held the fascination of Penn students for half a century, from the Civil War to World War I, even inspiring students to celebrate the event in poetry. Essentially the Bowl Fight was one of the many physical tussles between the freshman and the sophomores in which each class struggled to take the better of the other in an exciting show of force. The basics of the Bowl Fight were simple. The freshmen provided a bowl man, and the sophomores provided a bowl, often inscribed with their graduation year. The fight was decided in favor of the freshmen if they were able to break the bowl before the sophomores were able to place the bowl-man into the bowl. However, if the sophomores were able to place the bowl-man into the bowl, the sophomores won. The rules, the venue and the bowl of the game saw a lot of changes in the 50 year history of the Bowl Fight. Even though the bowl first made its appearance in 1865 and the custom of putting the bowl man in the bowl was there in 1866, the fights themselves actually started in 1867. 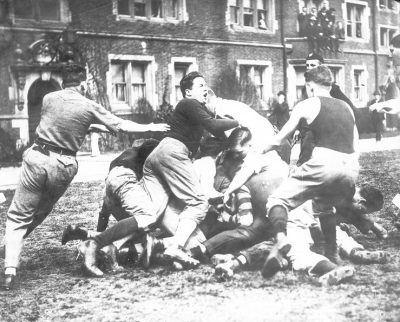 The custom came to an end with the 1916 bowl fight when a freshman, William Lifson ’19 was killed in the fight.